REFUGIO, Texas —It’s only 3 p.m., but North Alamo Street is beginning to resemble a Texas ghost town. “Closed” signs tilt from mud-flecked doors. An errant piece of corrugated tin scrapes restlessly against a sagging fence post. A tattered American flag whips in the breeze, clanging against a bent flagpole. In the library, director Tina McGuill ushers a family toward a computer. The library got a new roof this summer, and though the hurricane removed a few shingles, all but 170 of the library’s 17,000 books were spared. Even more important, the library reopened quickly, allowing locals to use fax machines, copiers, computers, and internet access to connect with insurance agents, charity organizations, the state unemployment office, and the Federal Emergency Management Agency (FEMA). 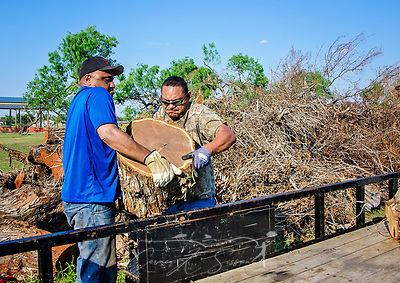 More than 75 percent of the town’s structures were damaged, some merely losing windows, others collapsing completely beneath the weight of uprooted, century-old mesquite trees. Every day brings new paperwork for beleaguered homeowners. But today is Friday. And in a few hours, heartache will give way to the magic of pigskin and sweat, dedication and dreams. In some ways, coastal Texas was ravaged twice by the lingering storm, which made landfall Aug. 25 in Rockport as a Category 4 hurricane. Winds in excess of 130 miles per hour lashed the coast for hours. Then the system stalled, dumping more than 51 inches of rain on the Lone Star State. Flood-prone cities such as Houston were quickly inundated, and a coastal crisis became a statewide catastrophe. As disaster relief organizations struggled to get to areas that were hit the hardest, the media glare focused on the dramatic water rescues under way in Houston and its suburbs. Small coastal cities such as Rockport and Aransas Pass were often overlooked, even though, weeks later, they are still barely passable. Some areas have only recently gotten power and water restored. Post offices have shifted mail services to other cities. Residents of Rockport are living 60 miles away in a Motel 6 in Beeville. 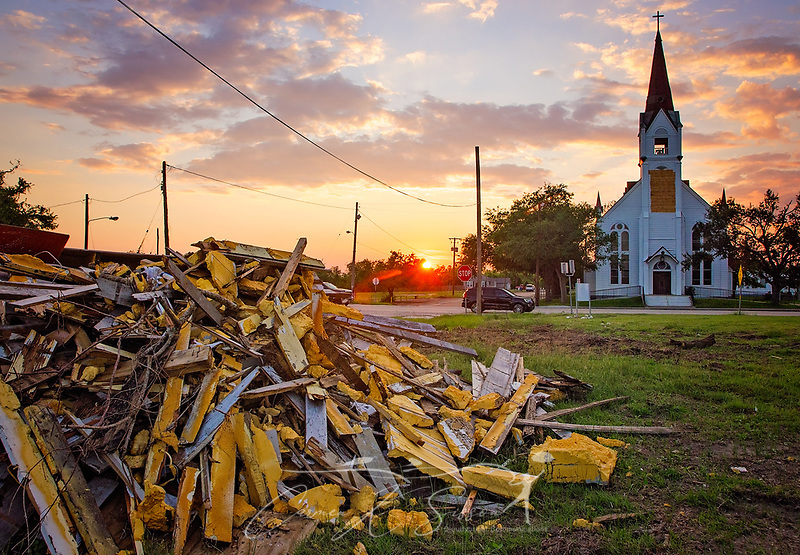 Yet places like Refugio, normally an anonymous drive-by town between Houston and Corpus Christi, have emerged as hopeful testaments to both the power of the people and the triumph of the human spirit. In one sense, Refugio is no different from other small towns across this fall’s Crescent of Catastrophe. It could be Immokalee, Fla.; or Marigot, St. Martin; or Fajardo, Puerto Rico – all communities caught in a primal struggle somewhere between survival and recovery. All places where residents are leaning on each other to defy destruction. All places focusing on the future to overcome a calamitous present. Yet each town brings its own identity to the process of revival, too. While Refugio is summoning a universal impulse to comfort the stricken, it is also tapping into a Texas culture of self-reliance and a local reservoir of humanity that is often magnified in small towns – here more than most. For it isn’t the tourists, the president, the cavalry, or the militia that is saving Refugio. It is the people themselves. This may be the most civil traffic jam in the United States. A ragtag pilgrimage of school buses and pickup trucks inches north along the narrow, faded gray ribbon that is US Highway 183, but there are no honking horns, no dirty looks, no one who seems to be texting while driving. 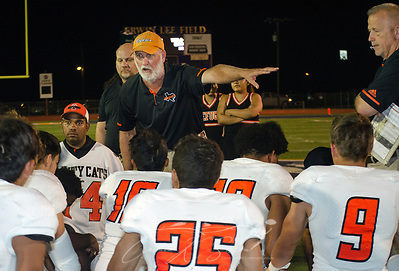 Instead, drivers and passengers smile and wave to neighbors as they begin the two-hour journey to Seguin, Texas, where the Refugio Bobcats will face the Navarro Panthers in the third football game of the season. If passersby are troubled by the roadside scenery – mangled businesses, gutted apartments, faceless homes laid open like broken dollhouses – you can’t tell. The Bobcats are overmatched tonight. Their school enrollment is half the size of Navarro’s, but both teams are good enough that they have to travel far to find opponents willing to play them. 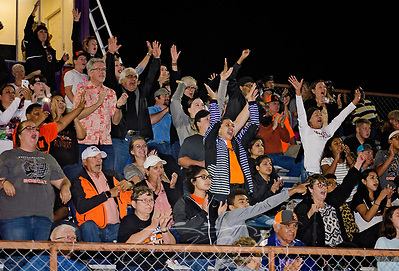 Last year, Refugio’s defense caught Navarro by surprise, allowing the team to eke out a 14-6 win. This year, the Bobcats have more to prove. Hurricane Harvey ravaged their field, destroying their scoreboard and parts of their school building. Players dragged family members to safety, holding plywood against broken windows and ignoring the rain as their homes caved in around them. Many lost everything and took refuge in the only home they had left – the team’s locker room, where Red Cross cots and blankets still vie for space with piles of mattresses, cases of water bottles, stacks of donated hygiene kits, and weights they’ve barely had time or energy to touch. In late September, a key player, junior defensive back Casey Henderson, fractured two vertebrae in his neck while making a tackle. Head coach Jason Herring broke down in tears in the hospital room. 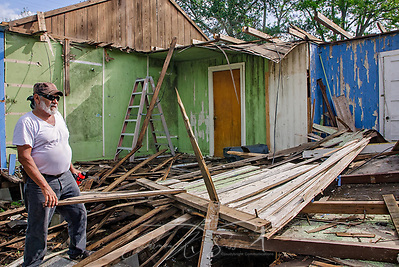 Football had been an escape for Casey and his brother, Sylvester, after they lost their home in the storm. But the Bobcats aren’t feeling sorry for themselves. Like the rest of Refugio’s residents, they stumbled outside after the storm to a world they no longer recognized. But when they looked across their tree-strewn yards, they saw a familiar sight – the faces of their neighbors. So they crawled out of the rubble, traded their football gloves for work gloves, and began helping their community rebuild. 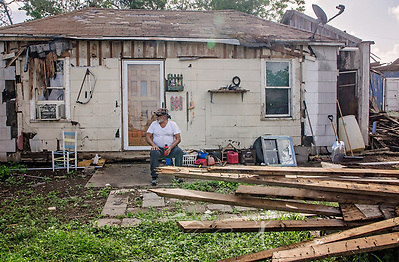 While they worked on their neighbors’ homes, other neighbors worked on theirs. And more than a month later, things are starting to look better in Refugio. Tonight, the town is hoping to score another win. Melissa Gonzales is on her way to the game, too – a reward following a long week. 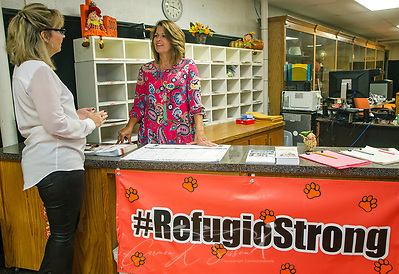 As superintendent of the Refugio Independent School District, Ms. Gonzales has found inspiration in the students’ resilience, even as she fights overwhelming exhaustion and frustration. She evacuated during the storm, but her husband, Sheriff Raul “Pinky” Gonzales, stayed behind. He called after the storm and described a chaotic scene of power lines covering the roadways and failed communications systems that left them cut off from nearby towns. He’d issued a mandatory evacuation, but many didn’t have the money to leave. He retained access to several school buses in case they needed them, but by the time people decided to go, the storm was too severe, and there was nowhere to flee. “Don’t come back yet,” he told his wife. But fear gnawed at her, and when she ­talked to Mr. Herring, he felt the same way. They had to know how their school and their students had fared. Before the hurricane hit, the newly renovated school was days away from opening. Gonzales had not even received the new keys. Semi trucks were en route to deliver new furniture, and she had to make a choice – allow them to come, putting the shipment at risk if the town took a direct hit from Harvey, or reject them and risk opening school with no office desks and chairs. She told them to come. As Gonzales and Herring stood in Refugio after the storm, staring at the standing water and scattered roofs, they turned with disbelief as their phones began buzzing with text messages. Students – some in shelters, others sitting in their ruined homes – wanted to know if school would start on time. Football players wanted to know when to show up for practice. Teachers also wanted to return. Sixteen of the district’s 152 employees have nowhere to live, and FEMA is only offering housing for individuals, not families. The district was able to pull enough makeshift classrooms together to begin school, but teachers and staff members are stashed into random corners in the hallways. They lack copiers, printers, computers, desks, keys, and even textbooks. They struggle all day in their damaged school, stumble into shelters and damaged homes at night, and pray on Sundays in church services that, in some cases, are now being held at the elementary school and local funeral parlor. As Gonzales fields phone calls and emails, she still manages a smile for employees who poke their heads inside her office door, making requests that on any normal day would be easy to accommodate. Earlier in the week, Gonzales broke down while trying to find a paper necessary to request public assistance. Her careful composure melted, and she fled the administration office, driving back to her two-story house, which sustained $80,000 in damage, and her yard, which is now festooned with tree limbs and shingles. She sat in her car and cried, then turned around and drove back to the office. Another employee helped her find the needed form. And another day came to a merciful end. More than 60 percent of the district’s 740 students are Hispanic, and more than 70 percent of the students are eligible for free lunch. But poverty may be no match for another Refugio characteristic – pride. The school is the centerpiece of the community, and the football team is the nucleus, but what’s going on here runs deeper than that. The people of Refugio have a strong, ethnocentric identity and a grit and determination born of being raised in harder times than these. They live in a community where English and Spanish are spoken interchangeably, and racial equality is the norm, not the exception. Everyone is expected to do their best, whether they are in the classroom, on the football field, or at the workplace. Other town leaders seem to adhere to that philosophy, too. Friday morning, over a breakfast of huevos rancheros and migas at La Ribera diner, Sheriff Gonzales compares progress reports with First Baptist Church pastor T. Wayne Price. Gonzales rode out the storm at the county courthouse with his fellow employees. Together, they watched as water poured through the roof and the double doors bulged in a futile effort to hold back the wind. Two of his deputies lost homes. The sheriff’s past experience as a game warden helped him quickly garner outside help for the area, but it was the townspeople themselves who grabbed their chain saws and nail guns and got to work. He believes he will soon have housing for his displaced deputies, and his own life is finding some normalcy, too. After working for weeks out of his pickup truck, the sheriff is moving to a temporary space at a nearby office plaza. Ms. Gonzales believes she will soon have housing for her displaced teachers, and a visit to the injured football player was encouraging – he is clamoring to begin physical therapy so he can return to his teammates. While he’s in the hospital, volunteers are repairing his family’s house. Mr. Price’s church lost almost everything in the storm, and the sanctuary was destroyed – stripped to ribbons of pink insulation and dotted with damp pages of ruined hymnals and Bibles. More than 95 of his members were affected or displaced by the storm, but every day brings the promise of recovery closer to reality. Gonzales, shifting uneasily next to him, flushes almost as pink as the long-sleeved shirt he is wearing and lifts his white cowboy hat. “Soon I won’t be able to wear this,” he jokes, noting that all this praise might lead to a swelled head. None of this means that people haven’t had hard questions for their pastors and for God. Price tries to reassure them by being honest, forthright, and presenting biblical truths. to attend one of the other churches in town or use the time on Sundays to help neighbors. He is encouraged by what he sees in Refugio. The town seems closer now. People are letting go of nitpicky quarrels because their priorities have shifted. One parishioner had avoided a friend for a long time because of an argument. Now the friends have mended fences, literally and figuratively. At the game with Navarro, the Refugio Bobcats are struggling, but their fans haven’t stopped cheering since they arrived. Though there are fewer people here than the 2,000 who usually attend away games, the visitors’ stand is packed anyway. The game gets off to a rough start, with Navarro scoring three touchdowns while holding Refugio to 10 points. In the second half, Refugio fights back. But eventually the team trudges off the field with its first loss of the season, 21-17. Fans like Philip Lewis and Douglas Franklin are unperturbed. Even though he suffered major roof and fence damage to his house, Mr. Lewis would never miss a game on a Friday night. Mr. Franklin went out into the height of the storm to rescue his grown children, whose apartment was collapsing. He has been stunned by the influx of volunteers, but the town’s esprit de corps doesn’t surprise him at all. And together, they all back their town. At the end of the game, parents, friends, and cheerleaders storm the field waving cameras and cellphones, clamoring for photos like paparazzi at a rock concert. 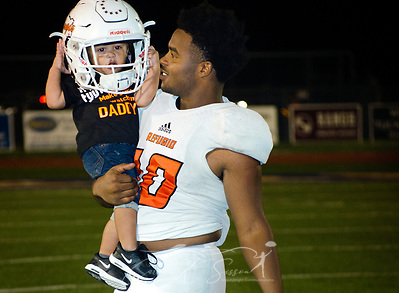 “Do that again,” coos Alexa Valenzuela, motioning for Bobcat running back Jacobe Avery to place his helmet on his 1-year-old’s head. Though Jacobe lost his home and the Burger King where he worked, he still has his family – and his team. 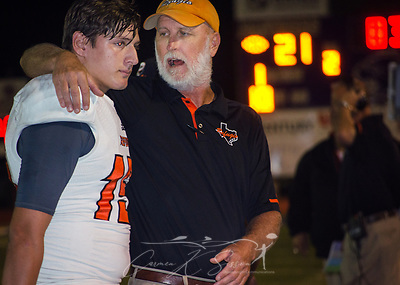 The Bobcats’ coach knows that this time on the field – win or lose – is what will mend his boys. They kneel before him, staring at the grass, waiting to be rebuked for their performance. He chides them for a moment, then softens his tone. One by one, they lift their heads and make eye contact, allowing him to scruff their hair, cuff their shoulders, hug them. Next week they will play again. Maybe they will win or maybe they will lose. But no matter the outcome, they will survive. Christian Science Monitor, disaster, favorites, football, hurricane, Hurricane Harvey, Refugio, Texas. Bookmark.